Nerve Drum Machine, Virtual Drum/Percussion from Xfer Records. Xfer Records has announced the release of its Nerve Drum Machine VST/AU instrument for Mac OS X and Windows. 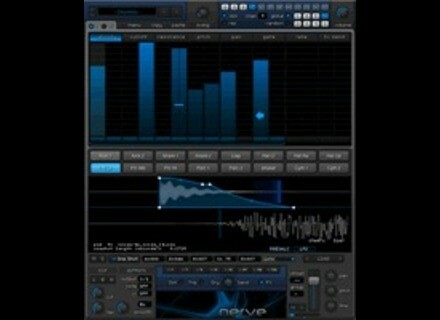 Nerve is a software drum machine designed to bring beat creation and manipulation to your sequencer. Nerve was designed and coded by veteran dance music producers, with a diverse sample library included from many of today's top sound designers. You can create your own beats from scratch using sounds you already have (AIF/WAV/REX/RX2/AKAI .SND), or utilize the factory-included Drum Kits, Presets, Patterns, and Sounds. Powerful Internal Step Sequencer: Nerve has an ergonomic mouse-driven Step Sequencer which allows you to program beats visually or by clicking rhythmically, with minimal mousing. Compact, hassle-free interface: Everything you frequently want to control is instantly accessible in Nerve - no fumbling and excessive paging around to get things sounding how you want, in a window which won't consume your entire screen real-estate. 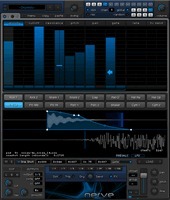 Thousands of Original Sounds Included: Nerve contains a large, comprehensive 2-Gigabyte library containing full presets, drumkits, patterns, one-shots, and loops made by a variety of world-class sound designers, including SampleMagic, PowerFX, Richard Devine, Dom Kane, SampleSquad, Bitword, Noise Inc., and many others, catering to a wide variety of musical genres. Sculpt your own original sounds: you can drag-and-drop soundfiles you already have on your hard disk (WAV/AIF/REX/RX2/AKAI SND format) and audition different samples instantly using navigation buttons. Random sample selection from the current folder (for one or all pads) is possible with hotkeys, for exploration of new sound combinations effortlessly. On-board editing with 22 simultaneous pre-calculated DSP types allows you to slice/trim, sculpt, stretch, and bend and re-synthesize sounds into completely new sounds, with no play-time CPU expense. Slice and Re-arrange loops: Nerve allows for a single pad to contain up to 16 slices of a loop, with adjustable slice points, which will automatically get read from REX/RX2 files. For traditional WAV/AIF loops, three different user-selectable time-stretching options are available (slice+fill, granular stretch, resample) to get your loop to match your host sequencer BPM. Let your Rhythms Groove + Gel: Nerve allows you to extract the timing + level information from a REX/RX2 loops, and have this apply to all of the rhythms with a single mouse gesture. You can store swing presets for future use. Performance-Oriented features: Nerve features a unique Repeater control which allows you to re-trigger one or more pads on-the-fly to create fills and variations on-the-fly. Trigger / Re-trigger patterns with the mouse or MIDI notes. Re-triggered portions can be automatically 'sent' to a different output pair for additional external processing on those specific moments. Unlike audio-based buffer-repeating effects, Nerve's Repeater will follow swing/groove feel on a global level, maintaining your groove. Furthermore, re-triggered steps will also generate new MIDI-out notes, if using Nerve for controlling external samplers, etc. Realtime Sculpting Control: Each pad contains a unique 'fat' 2x-oversampled State Variable Filter. Flexible LFOs allowing you to make parts vary over time (pan/level/cutoff/reso/sample start), allowing for parts to sound more fluid. MultiStage Envelopes with tension curves allow for dynamic sculpting with high precision. A unique GATE parameter allows the envelope length to rescale, sequenced per-step and/or controlled/automated externally. Internal Sidechain-input Compressor: Get your beats to pump without all of the in-host bussing hassle. Pad Independence: Each pad can optionally run its own pattern chain, length, and randomize, making it very easy to create polyrhythms / polymetric beats giving your music productions interesting, unique flair. Multiple Output capability: (8 stereo pairs) allow you to separate various parts of the beat for external mixing/processing. MIDI support (both input and output): control Nerve from a MIDI controller using assignable MIDI notes. Control Nerve parameters from MIDI CC messages. MIDI Out control allows you to use Nerve as a "sequence engine" to generate notes/CC's in unique ways / control or layer other synths and samplers. It costs $199. A demo version is now available. XLN Audio Ballad Grooves MIDI Pak XLN Audio has announced the release of the Ballad Grooves MIDI Pak. MOON for Ultra Analog VA-1 Daniel Stawczyk (aka Status) has released MOON, a 200-preset bank for Applied Acoustics Systems' Ultra Analog VA-1. Zplane Updates Elastique Pitch Elastique Pitch has been updated to v1.1.